Reviewed by Dan Stumpf: MAURICE HELBRANT – Narcotic Agent. MAURICE HELBRANT – Narcotic Agent. Ace Double-15, paperback, abridged, 1953. Originally published in hardcover by Vanguard Press, 1941. This is one of the most expensive books in my collection, so I read it carefully, but when I finished I had to wonder what all the fuss is about. Don’t get me wrong; Narcotic Agent is a tough, reasonably well-written book, and as a document from the days when attitudes towards drugs and drug-users were very different, it’s a vivid artifact of its time. Helbrant was a Federal Narcotics agent for more than 15 years, beginning in the days of Prohibition, and during that time he seems to have carried out his job with admirable professionalism, which comes through very effectively in his account of those days: calm, matter-of-fact, and untinged by that megalomania one finds in the ghost-written memoirs of J. Edgar Hoover. He’s just a guy doing a dangerous job and doing it well. It’s this professionalism in fact that mitigates against Narcotic Agent as literature. There’s no clear narrative line here, just a simple recounting of case after case (after case, after case…) of him working, usually undercover, with drug addicts and stool pigeons to catch their dealers and thence to the organized gangs of dealers. Helbrant occasionally stops to reflect on the nature of Narcotics and their effect on Society in his day, but not often; usually just a few lines about why he’s doing all this and then back to the job at hand. One appreciates the competence, and the absence of sanctimony — rare in books about Drugs in those days — but the result is only readable, not entertaining. All of which left me wondering why Narcotic Agent is such a valuable book. Copies can go for as much as $5,000, which is surprising for a tome as ordinary as this. Perhaps someday I’ll flip it over and see if the other side is any good…. Reviewed by Dan Stumpf: JOHN MAIR – The Fourth Forger. JOHN MAIR – The Fourth Forger. Cobden Sanderson, UK, hardcover, 1938. The Macmillan Company,US, hardcover, 1939. Several years ago on this blog I reviewed John Mair’s witty, off-beat thriller Never Come Back. 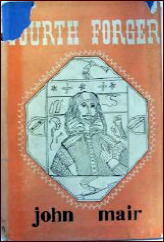 Subsequent to that, I learned that Mair had written only one other book before his untimely death in WWII, this non-fiction study of a young gent named William Ireland and a controversy over “newly discovered” writings by William Shakespeare — a controversy that became a scandal that stirred London in the 1790s. William Ireland was the son of Samuel Ireland, a prosperous collector and dealer in antiquities, and an avid Shakespeare enthusiast — he named his first son William, didn’t he? Every evening Samuel read to his children from the Bard, and this undoubtedly had an influence on William, but not so much as his father’s near-total indifference to him. Samuel casually dismissed his son as dull and stupid (which for a long time supported the case for the Shakespeare Forgeries, as William was considered totally incapable of writing them) and placed him as apprentice to a legal office where William found himself with little to do but sit in an office, surrounded all day by musty old parchments. Very old parchments. Here’s where Mair’s genius as a writer comes to the fore: Without disparagement or bathos, he evokes young William’s frustration and (probable) desperate need for his father’s approval, a need that drove him to seek out a suitably old scrap of parchment, draft a minor legal document in suitably antiquarian ink, and forge Shakespeare’s signature on it. When he presented this to Dad, William finally got a morsel of parental approbation — which left him hungry for more. You can probably anticipate the rest. William worked up a convincing (to his dad) cover story about a wealthy and conveniently anonymous benefactor who kept a steady trickle of “treasures” that grew ever more fabulous. There were other documents. Then letters. Then a Profession of Faith that “proved” Shakespeare was not Catholic. And on and on. William’s father Samuel began showing these to friends, then to authorities on the Bard, and they met with acceptance and even adulation, particularly the Profession of Faith, because it seemed to say what everyone wanted to hear. Flushed with success and his father’s long-withheld esteem, and convinced of his own genius, William went to the next step: An original manuscript of King Lear in the author’s own hand, differing from the original only in being more attuned to contemporary tastes. Needless to say, it was met by a public overjoyed to see that the writer they idolized actually catered to their own standards, and that anything objectionable must have been put there by later, inferior hands. Heady with success, William rushed into his next “discovery”: a lost play titled Vortigern. All this while of course, there were doubters. And William’s success/excess only made his work a larger target for analysis and debunking. Again, Mair does a fine job evoking the characters of the men who were actually right about the spurious nature of William Ireland’s Shakespeare Papers, but who were also mostly motivated by their own self-interest or idiosyncrasies. At the same time, he tells an intriguing and often poignant story of his father’s growing desperation as friends, fans and a fortune slipped from his grasp — all because of a son he publicly scorned. Writing like this makes The Fourth Forger a pleasure to read, and I followed this account of scandal and hurt feelings avidly to the end. You may too. 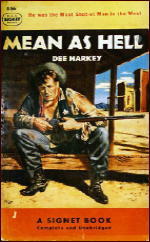 A True Western Review by Dan Stumpf: DEE HARKEY – Mean As Hell. DEE HARKEY – Mean As Hell. University of New Mexico, hardcover, 1948. Signet, #856, paperback, 1951. Ancient City Press, trade paperback, 1989. I don’t have much to say about Dee Harkey’s Mean As Hell except that it deserves to be better known. Harkey’s account of his work as a Peace Officer in the old west, from the 1870s until 1911 is a work of interest, excitement and considerable charm. His naïve (in the best sense) style and easy narration of his life and times — from being besieged on the prairie as a child by “110 Indians” (I love that touch!) to the escape of a local badman by Flying Machine — lend a unique charm to his tales of rustlin’, shootin, fightin’ and all the assorted mayhem one reads a Western in search of. Find a copy of this somewhere and enjoy it! 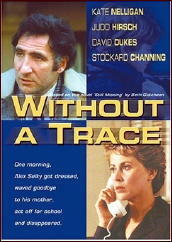 A Movie Review by Walter Albert: WITHOUT A TRACE (1983). WITHOUT A TRACE. 20th Century Fox, 1983. Kate Nelligan, Judd Hirsch, David Dukes, Stockard Channing, Jacqueline Brookes, Keith McDermott. Screenwriter: Bess Gutcheon, based on her novel Still Missing. Director: Stanley R. Jaffe. One of the things that has always struck me in the classic “Damsels in Distress” (DID) films is the almost total absence of women other than the star. DIDs attract either psychos or sympas but never, or almost never, another woman. However, the revolution in social roles has not gone unnoticed by filmmakers, and a recent example of the DID film reflects some of the changes. Without a Trace, a film version of Bess Gutcheon’s Still Missing, based on the real-life story of the still unsolved disappearance of a six-year-old boy on his way to school, was promoted by our local critics as an entertaining, well-made	film. In	the	face	of overwhelming apathy, the film was held over for two or three desultory weeks and then shunted off to the Regency Square, where I saw it on a Friday night with a substantia1 family audience. Without a Trace stars British actress Kate Nelligan (who earned her credentials as a DID specialist in Eye of the Needle) and Judd Hirsch. playing the police lieutenant who’s put in charge of the investigation when Nelligan reports her son missing. My wife pointed out to me that the quote attributed, during a lecture on Robert Frost, to Pope was actually from Emerson, but I found the slip (for which we should really hold the screenwriter responsible) engaging and a reminder that no film based on “real life” is real and that a British actress posing as a professor of American literature in an American university is, after all, only playing. 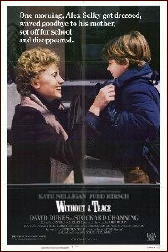 In Without a Trace, Nelligan has a mother, a best friend, and some sympathetic women neighbors, but true to the demands of the DID film, she is abandoned by all of them, and at the moment of crisis she is alone, without even the male policeman apparently willing to listen to her. And it is at this moment, when everything seems hopeless and she’s almost ready to give up, that a deus ex machina is introduced to turn the situation around. And, since these are the eighties, the deus is a dea. In the Doris Day film, Doris hung in until the very end, and although the men are, at times, almost literally propping her up to get her out of the Perilous Predicament, the Star is always center stage. In this example of female New Cinema, the star is allowed to go off-stage during the climactic chase. This permits the Inferior Male (Hirsch) to redeem himself but also involves one of the most unlikely coincidences (“Daddy, let’s go to the park”) and extreme double-takes that I’ve suffered through since the days of the Monogram serials. Nelligan is attractive and probably intelligent, and Hirsch is fine, but this DID variation finally succumbs to the same weakness that plagued the romantic DID vehicles: implausibility. And the virtues of Without a Trace — the good cast, fine photography, and tragic but not unusual situation — only serve, finally, to expose rather conceal the threadbare plotting. Vol. 7, No. 2, March-April 1983. Previously on this blog: DAMSELS IN DISTRESS, PART ONE (Julia, 1956). Editorial Comment: The author’s book and the movie are based on the true-life disappearance of Etan Patz, who went missing in New York City’s Lower Manhattan on 25th May 1979. On May 24, 2012, Police Commissioner Kelly announced that a man was in custody who had implicated himself in the Patz disappearance. According to a New York Times report from 25 May 2012, the police had at that time no physical evidence to corroborate the man’s confession. 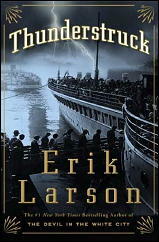 A Review by David L. Vineyard: ERIK LARSON – Thunderstruck. ERIK LARSON – Thunderstruck. Crown, October 2006. Trade paperback: Three Rivers Press, September 2007. Within twenty-four hours Captain Kendall would discover that his ship had become the most famous vessel afloat and that he had become the subject of breakfast conversation from Broadway in New York to Piccadilly in London. He had stepped into the intersection of two wildly disparate stories, whose collision on his ship in this time, the end of the Victorian era, would exert influence on the world for the century to come. Alfred Hitchcock was so fascinated by it that he included elements in two of his films, Rear Window and Rope. As it was happening, then Home Secretary Winston Churchill had his home wired with the new Wireless technology so he could follow the case even when he as away from the Home Office. It was the basis for novels by Ernest Raymond and Francis Isles among others, and even Raymond Chandler refers to it in one of his novels. Head of Scotland Yard’s Murder Squad, Frank Froest, later a mystery writer, was involved. It made the career of the young forensic genius Bernard Spilsbury who would later help catch George Joseph Smith, the Bath Murderer, and help convict Christie, the Rillington Place murderer. It was the case of the young century, and perhaps the first worldwide news event followed by millions as it unfolded virtually live before them. It was highlighted by one of the most brutal and bloody murders in history and a spectacular race across the Atlantic monitored by fascinated readers across the world. Today the name Dr. Crippen still brings up images of a mild mannered little man, his beautiful lover, and a dogged Scotland Yard Inspector in the chase of his life. 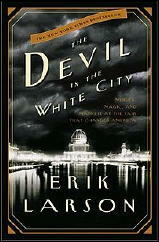 Erik Larson, whose earlier book The Devil in the White City, was the story of serial killer H. H. Holmes and the 1893 Chicago World’s Fair, combines in Thunderstruck the story of Gugliemo Marconi, the creator of the wireless, and Hawley Crippen, one of the most notorious murderers of the Twentieth Century, and how their two stories came together to foil a nearly perfect murder and give birth to modern communications, and in one sense the modern world. Hawley Crippen was an American eye doctor living in London and in a bad marriage. When his wife Cora disappeared, the facts did not add up and the police began to suspect something was wrong. Gugliemo Marconi was a brilliant but troubled inventor obsessed with the idea that radio waves could be transmitted through the airwaves without traveling through wires — from a transmitter to a receiver. His invention would transform the world, but it would take the spectacular Crippen case to demonstrate its potential to the world at large. The two stories came together on a British ship, The Montrose, commanded by Captain George Kendall. Hawley Crippen and his mistress Ethel La Neve had disappeared, sought by the police, when Captain Kendall noticed something odd about two of his passengers, Mr. Robinson and son. Armed with his suspicions Kendall used the Marconi as the wireless was known to contact the authorities, and set off one of the most famous pursuits in criminal history — one that would not have been possible without Marconi’s invention. Imagine if you can the pursuit of O.J. Simpson’s white Bronco going on for days across the breadth of the Atlantic. Even the cleverest mystery writer would have trouble coming up with a scenario as improbable as what followed. Inspector Walter Dew, in charge of the case, boarded the Laurentic, a sister ship of the Montrose, in a race to reach Canada before Crippen, so the doctor and Ethel LaNeve could be arrested on the Montrose — which was British territory as long as it was at sea. What made this case unique was that the world press traveled in his wake, and every aspect of this chase was wired hourly to the breathless world, while in London the noose that would hang Crippen drew taut as the new science of forensics pieced together the story of the brutal death and bizarre fate of Cora Crippen’s corpse. Meanwhile on board the Montrose, Kendall and his officers worked to keep Crippen and La Neve and the other passengers ignorant of the whirlwind of events surrounding them, while Dew raced to pass them and arrive in Canada first. Kendall watched Dew. The captain looked for some sign that Dew recognized the passenger below. The inspector said nothing. Kendall led the party to his cabin and sent for Mr. Robinson. A few moments later the man appeared, looking unconcerned and cheerful. Agatha Christie could not have written it better. Larson follows up on the fates of those involved. The spectacular trial that became an international sensation, Dew’s retirement after his most famous case, Captain Kendall’s adventurous career that reads like a Conrad novel, Mussolini praying at the beside of the dead Marconi, the still unanswered questions regarding the murder, and a final touching interview with Ethel La Neve shortly before her death. Thunderstruck reads like the best of novels, but has the weight of truth behind it. Carefully crafted and brilliantly written, it is a true crime story that compares with the best fiction for twists, turns, and moments of crime-solving worthy of Dr. Thorndyke or Sherlock Holmes. A fascinating look at one of the key events in the birth of the Twentieth Century and modern communications, and in the wake of cell phones, ipods, instant video, and world wide satellite communications — a reminder that the world was once much larger. Though Jung might have been right when he said that it was made of glass for a murderer, the birth of the modern world made that metaphor reality for Hawley Crippen. A Review by Dan Stumpf: ELYESA BANZA – I Was Cicero. ELYESA BAZNA, with Hans Nogly – I Was Cicero. Harper & Row, hardcover, 1962. Paperback reprint: Dell, 1964. In I Was Cicero Elyesa Bazna relates how he angled himself a job as valet to the British Ambassador in Turkey so he could spy for Germany in 1943 under the code name “Cicero” — employment that became famous in 1950 when L. C. Moyzisch, his German contact man, wrote Operation Cicero, and even more famous in �52 when Joseph L. Mankiewicz filmed it as 5 Fingers. But it was “Cicero” who became famous, not Bazna. So I guess Bazna, toiling in obscure poverty in Turkey, looked around at everyone getting rich off his story and decided to cash in on it if he could. I Was Cicero (co-written with Hans Nogly) never found the popularity of 5 Fingers, but it’s a generally engrossing and often insightful look inside the mind of a spy. Bazna cherishes no illusions about himself; he admits from the start that he was a lower-class working man of minimal education, with no polish, little imagination and unprepossessing appearance, who had the ambition to take a chance when he had it, and the smarts to get out when the going got dangerous. He was also cheated outrageously by his Nazi paymasters, for whom he insists he worked in good faith. So where Moyzich’s Operation Cicero is mostly about Moyzisch and his growing realization that his superiors in Berlin were mad — and the moral dilemma of trying to serve his country in such times — Bazna’s I Was Cicero is just about a guy doing a job that happens to be incredibly dangerous. 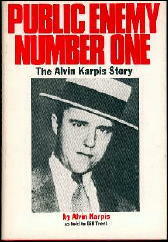 And though Bazna was stealing secrets instead of robbing banks, he admits, like Alvin Karpis, to getting hooked on the excitement of it, and the sheer visceral pleasure of having money. Like Karpis, he makes no excuses for his work; he just takes pride in a job well done. Afterword: When Joseph Mankiewicz filmed 5 Fingers (1952) he pretty much cut out Moyzisch’s part, added some incidental characters and a sub-plot to move things along, plus a suspense-evoking score by Bernard Herrmann to lend the whole thing a creepy mood. His biggest change, though, was to turn the character of working-class schlub Elyesa Bazna into the suave, classy James Mason, who played the part to sinister perfection. David L. Vineyard on the Texas State Police vis a vis the Texas Rangers. The problem with the Texas State Police was two fold. First they were imposed in place of the Rangers by the Federal government after the Civil War, and second they were highly politicized with positions of authority being sold to the highest bidder, who in Reconstruction Texas were likely to be carpetbaggers and crooks � the only people with any money. They would have been resented even if they had done a good job, but by any standard they accomplished nothing and the state had descended into such a chaotic condition under them that even the Army wanted them disbanded and the Rangers reformed. They managed to hold on until 1876 when the Rangers were reformed in response to wide spread outlawry and the renewed threat of the Comanche and Apache in western Texas. Anyone wanting to know more should read Walter Prescott Webb�s The Texas Rangers which is an epic Pulitzer Prize winning history of the organization from it�s origins in the Austin colony to 1936. 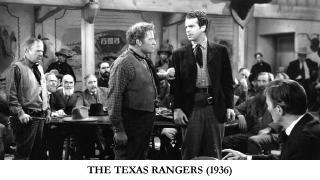 It was also loosely the basis of the movie The Texas Rangers (1936), directed by King Vidor with Fred MacMurray and Lloyd Nolan, remade as The Streets of Laredo (1949) with William Holden and William Bendix. 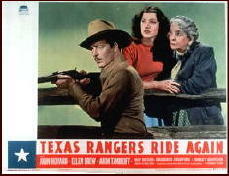 The sequel, The Texas Rangers Ride Again (1940) was a B film, but had a screenplay by Black Mask alum Horace McCoy, and reflected the stories he did of modern Ranger Jerry Frost in the Mask. The Rangers were hardly pristine, but because the organization was always small and depended on the authority of one man with a badge and a gun it seldom had the bureaucracy to be as corrupt as the Texas State Police. Even today there is some confusion that the Texas Highway Patrol and the Rangers are the same. They aren�t. The Rangers are a separate investigative unit within the state police who aid in state wide crime enforcement and are called in by small towns and counties when needed. For most of the 20th century there have seldom been more than 500 Rangers who are recruited from the police forces around the state. Like the FBI they provide CSI and other support for localities who can�t afford their own labs and investigators. Contrary to their reputation for gunplay they actually have a good record of negotiating peaceful endings to bad situations and most agree if the FBI and ATF had left Waco to the Rangers they could have ended it peacefully. It isn�t that they haven�t had their bad times. In the 1920�s when Pa and Ma Ferguson controlled the governors office the Klan got a toe hold in the Rangers. A new administration brought in the legendary Colonel Homer Garrison who cleaned the Rangers up and turned them into a modern police unit. Garrison was so successful that during WWII he was chosen by FDR and Winston Churchill to reform the police in former Nazi controlled territories in North Africa, and helped to reform the French and German police when the war ended. Supposedly Stalin invited him to Russia to help reform the Russian police but he politely declined. That said the Rangers again had some trouble during the sixties during the race troubles, but again reformed and cleaned up their act. Notably even during this period it was a single Ranger who ended boss rule in South Texas when he brought down the infamous Duval County Bosses ending the virtual slavery of itinerant workers in that part of the state. Another film to see tackle the Texas State Police is Galloping Legion, a better than usual Bill Elliot western with Jack Holt. Not an A perhaps, but a B+ certainly. The Rangers, like Scotland Yard and the RCMP, trade on their legend for part of their effectiveness, but like those organizations have been aided by legendary members from Deaf (Deef) Smith and Big Foot Wallace, Rip Ford, McNelly, Lee Nace (yes, that�s where Lester Dent got the name � Nace was the Ranger who befriended William Henry Porter, O Henry when he was arrested and who is the model for the sympathetic Ranger Captain in the story that introduced the Cisco Kid), and Red Burton who arrested John Wesley Hardin and once put down a riot single handedly inspiring the �one riot one Ranger� saying (not the motto of the organization � that�s �Know you are right, then go ahead�) enshrined on the statue of Ranger Lobo Gonzales that stood in the lobby of Dallas Love Field. Other noted Ranger�s included the aforementioned Lobo Gonzales who cleaned up the oil boom town of Kilgore in one afternoon and Frank Hamer who hunted down Bonnie and Clyde. And I�ll confess aside from being a little prejudiced as a Texan, I�m the great grandson of a Ranger, so take all this with a grain of salt and do your own research. While they have their low points the actual unvarnished history of the Rangers reads like a novel. Even today a single Ranger carries with him the authority of the entire state. They aren�t infallible, and there are black marks in their history, but for once much of the hype is based on fact instead of public relations. TMF Reviews by William R. Loeser: ELLERY QUEEN and JOHN DISCKSON CARR. That Ellery Queen’s International Case Book is not included in Hubin’s Bibliography gives credence to what is only implied in the book itself — these short accounts are of true occurrences. If correct, several of these criminal cases deserve more detailed and less dramatised presentation than given here in what were originally articles for a Sunday supplement. Particularly interesting are the bank robber who, posing as a health officer, poisoned all the employees of a bank so that he could gather and carry off his loot unimpeded; the mistress who had her lover blinded so that she could care for him for years and thereby be permitted to obtain respectability through marrying him; and the banker who dismembered and disfigured his laborer rival, hired a sculptor to make for the police a representation of the deceased as the banker to convince them the wrong man died, but was caught because he couldn’t permit the calloused hands to be found. And yet, as elsewhere, one regrets the slipshod artistic integrity of the later Queen in the presentation of these cases. Recently I was stranded nearly bookless and erroneously chose John Dickson Carr’s Captain Cut-Throat over a couple of unappetizing offerings by Marsh and Lathen. I realized, part way through it, that I had read it twice before and, by the time I finished, that it is the worst mystery I’ve read. I think Carr was writing for Hollywood, and he achieved the almost impossible of under-estimating producers’ intelligence. The less said about this book, the better. ELLERY QUEEN – Ellery Queen’s International Case Book. Dell 2260, paperback original, 1964. JOHN DICKSON CARR – Captain Cut-Throat. Harper & Brothers, US, hardcover, 1955. UK edition: Hamish Hamilton, hc, 1955 (shown). 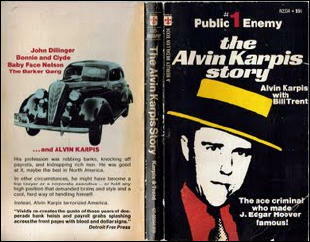 Paperback reprints (US): Bantam A1472, 1956; F2708, 1963; Charter, 1980, Carroll & Graf, 1998. Enjoy reading your blog, thanks! Have a question you can hopefully help with concerning Alan Hynd and the supposedly true stories he wrote for True Detective Mysteries etc. Am doing research on a distant relative named William Watts who worked as an engraver in the Count Lustig counterfeiting ring circa 1930-1935. Hynd authored a six part series in TDM in 1937 about Lustig and Watts. While the major facts jibe with historical data the personal story regarding the two outlaws seems quite fanciful. How much truth can one rely on coming from these types of stories? Believe it or not two of the TDM episodes were found in Watts’ Secret Service file. Also do you have any idea on a method for contacting his son Noel Hynd? If anything, true crime is a category about which I can safely say that I know less than nothing, if it could be possible, so anyone who knows more than I do, or have been able to uncover so far, please chuck a life preserver my way. I’m in over my head, in other words. * * Alan Hynd’s Murder (Duell, 1952, hc) Collection. Somewhat dramatized true crime. * * Brutes, Beasts and Human Fiends (Paperback Library, 1964, pb) Collection. Dramatized true crime. * * The Case of the Lady Who Took a Bath (Berkley, 1957, pb) Collection. Dramatized true crime. * * Great Crime Busters (Putnam, 1967, hc) Collection. Dramatized true crime, intended for younger readers. * * Great True Detective Mysteries (Grosset, 1968, hc) Collection. Dramatized true crime. * * In Pursuit: The Cases of William J. Burns (New York: Nelson, 1968, hc) [Series Character] William J. Burns] Collection. Dramatized true crime. * * Murder! Great True Crime Cases (Penguin, 1947, pb) Collection. Dramatized true crime. * * The Pinkerton Case Book (Signet, 1948, pb) Collection. Dramatized true crime. * * Prescription: Murder (Paperback Library, 1962, pb) Collection. Dramatized true crime. * * ’Til Death Do Us Part (Paperback Library, 1962, pb) Collection. Dramatized true crime. * * Violence in the Night (Gold Medal, 1955, pb) Collection. Somewhat dramatized true crime. Perhaps the question asks itself. Does “dramatized” equate to “fictionalized?” I haven’t asked Al yet what his standards or definitions are in this somewhat borderline category, but when I do, I’ll add his reply as an update. Dramatized is the correct word, thanks. My problem is separating fact from fiction. For example: As Hynd writes in his articles of an important connection between Al Capone,Count Lustig and my relative William Watts I just wonder what his sources for information were? I am hoping since some of Alan Hynd’s articles were in Watts’ Secret Service files (ones I uncovered thru the FOIA) that he had some great contacts. Who knows? HYND, NOEL (1947- ); Born in New York City, the son of Alan Hynd, 1908-1974, q.v. ; raised in Connecticut, educated at University of Pennsylvania; crime reporter. Doing some quick Googling, this list does not include, within the proper time frame of 2000 and before, The Prodigy (1997), which appears to be a supernatural horror story only. Dave is now attempting to reach Mr. Hynd through Forge. All very imprecise, I’m afraid!